Find your ParkMobile zone number, start your parking session, and get where you need to go. ParkMobile is the smarter way to pay for parking in Palo Alto! Get the app for iOS or Android. What's Zone Parking in Palo Alto with ParkMobile? Need to park around Palo Alto? You'll need to download the ParkMobile app on your smartphone. Then sign in to your account and type in your zone number. Your ParkMobile zone number can be found on green signage on decals on the meter or around the parking lot. You can also locate your zone number on the interactive parking map in the app. Your zone number is important! You can't start a parking session correctly without it. You must identify your ParkMobile zone number on the green ParkMobile signs located in your on-street parking area. If you end up using the wrong zone number, your city's local parking enforcement won't know that you've paid and may issue you a parking ticket. Keep in mind that you can't change zones or move spaces once your parking session starts. Zone numbers are different from city to city and state to state, so don't assume that one zone has the same number as another — especially if you travel a lot! Find Zone Parking Around Palo Alto Now! If you're still circling the block looking for easy Palo Alto parking, you're stuck in the Stone Age! Now that you know how easy on-street zone parking with ParkMobile can be, it's time to give it a try on your next drive! Let ParkMobile be your Palo Alto parking guide. 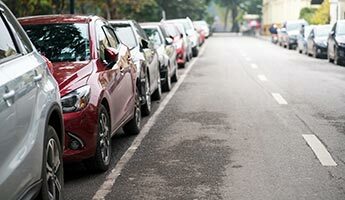 With more than a million parking spaces in thousands of locations in the U.S., we're able to connect you with fast and affordable parking near most major Palo Alto attractions, including busy airports, sports arenas, amphitheaters, schools, and more! Download the ParkMobile app, enter the zone number, and get an early start wherever you're going – museum, courthouse, opera, festival, big game, or brunch with friends and family. At last, it's easy to find and pay for parking in Palo Alto. ParkMobile's pay by phone parking solution means you can find an empty parking spot pretty much anywhere!